O&G Industries, Connecticut’s largest privately-held construction company and top construction manager for school projects, recently transformed an old grist mill, originally constructed in 1673 on the bank of the Farmington River, into the new admissions building for one of the nation’s most historic boarding schools, Farmington’s Miss Porter’s School which welcomes nearly 500 admission candidates from around the world each year. 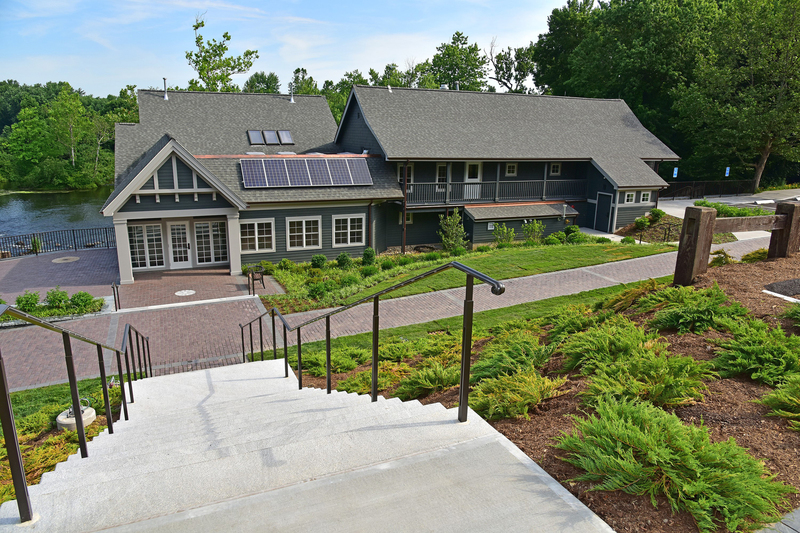 The property, home to the former locally renowned Grist Mill Restaurant on Mill Lane in Farmington, was renovated and re-purposed into the school’s new admissions building. All new state of art electrical, including photovoltaic panels, HVAC and high end finishes, including re-claimed barn board flooring were installed as a part of the 6,500 sf renovation project. Existing mill grinding equipment is retained on the second floor of the original mill. Exterior improvements include new stair tower, all new windows, siding, roofing, and a complete redesign of the site with new drainage, grading and landscaping, retaining walls and brick paver patio and feature entrance planter. An original grist mill grinding stone is incorporated into the new patio surface. Work on the project began in November 2015 and was completed on time for a June 2016 turnover to the school, within the allotted seven month construction schedule. Drummey Rosane Anderson (DRA) was the project architect. O&G was the construction manager for the project. O&G also supplied mason products for the project through its Mason Products division. O&G recently completed several Greater Hartford area building construction projects including a new entrance at the historic Cathedral of Saint Joseph in Hartford, upgrades at Hartford’s Union Station, an interior renovation at the St. Francis Hospital’s Comprehensive Women’s Health Center and the CREC Academy of Aerospace and Engineering in Windsor.